I was 13 when I got my first period. Locked up in a bathroom stall in my school in Bangalore, India, staring down at my blood-blotted underwear, a wave of inexplicable shame swept over me. My mother had already had the talk with me, so I was aware of what to expect, but nothing prepared me for the awkwardness and guilt that would soon follow. That was just the beginning. From hiding sanitary napkins in anything-but-discreet black bags, to referring to my period in code words, silently denying my cramps as inexplicable “stomach pain,” to avoiding discussing my period altogether, my shame made deep inroads into my everyday life. For many years I didn’t think to examine where this embarrassment stemmed from. I was lucky to be born to Indian parents who smashed every stereotype possible with an upbringing that encouraged us to question gender binaries all the time. My mother cared enough to have the conversation early, while constantly reinforcing the fact that menstruation was nothing to be ashamed of. Our periods were openly discussed at home alongside my father as well. This is practically unheard of in most Indian households. Born into an educated and liberal Indian family, I have access to information and sophisticated period care. From a health and hygiene standpoint, this means my daily life isn’t disrupted by it. I have the ability to choose safe, sustainable menstruation products, and get medical aid in times of need. But I’m in the privileged minority. By some estimates, 88% of menstruating women in India have no access to sanitary napkins, and 200 million women lack awareness of menstrual hygiene. But even in the social context, I’ve seen rampant taboos and myths related to menstruation that stifle women every day. In India, across socioeconomic classes, girls are often considered impure, contaminated, and dirty when they menstruate. This manifests in severe exclusion, segregation, curtailed movements, and dietary restrictions for young girls and women. From being forbidden from entering the kitchen to eating in isolation, these customs and mores stem from seriously oppressive notions attached to menstruation. There’s also a widely popular myth that if a menstruating woman touches a pickle jar, it will most certainly go bad. Myths like these further propagate a culture of silence, in a patriarchal society where girls and women are already mistreated. Silence feeds shame, shame feeds silence and this vicious circle has hampered the dialogue around menstrual hygiene from reaching some of the most disadvantaged women in India. WaterAid’s Menstrual Hygiene Matters report states that globally, approximately 52% of the female population (26% of the total population) is of reproductive age and will menstruate each month. Around 70% of all reproductive diseases in India are caused by negligent menstrual hygiene and women continue to put their health, livelihood and dignity at risk. This is so worrisome, considering women have been menstruating since the beginning of time. Period-shaming gives tangible form and meaning to the extreme discrimination millions of girls have experienced, and continue to experience across my country. A whopping 39% of girls in India use just water, no soap, for washing their menstrual protection. In many cases these are cloth pads, but can even be made of wood shavings, dried leaves, hay or plastic. A further 20% of girls reported that they do not have access to a toilet when menstruating. For a natural bodily function that has existed for centuries, it’s unforgivable how shaming has stunted necessary conversations about menstrual hygiene management. This has led to menstrual hygiene being a low priority for governments, health and education ministries. The silence around menstruation is so culturally ingrained that despite living in a home without restrictions, around me, I saw innumerable examples that silenced me. Extended family firmly objected to girls visiting religious places during their period, for fear of hampering the ‘purity’ of the place. We were routinely told to wear black pants to “avoid embarrassment.” There was nothing worse than the world knowing you bled! I watched a bunch of 14-year old girls bully a classmate; she was among the first in our cohort to get her period. I lived in perpetual dread and avoided going camping or on field trips during “that time of the month.” Well into my adulthood, period talk was reduced to a vocabulary of disparaging words. “I’m down” or “unwell” is still a common way to escape talking to family, friends, and employers about being on your period. 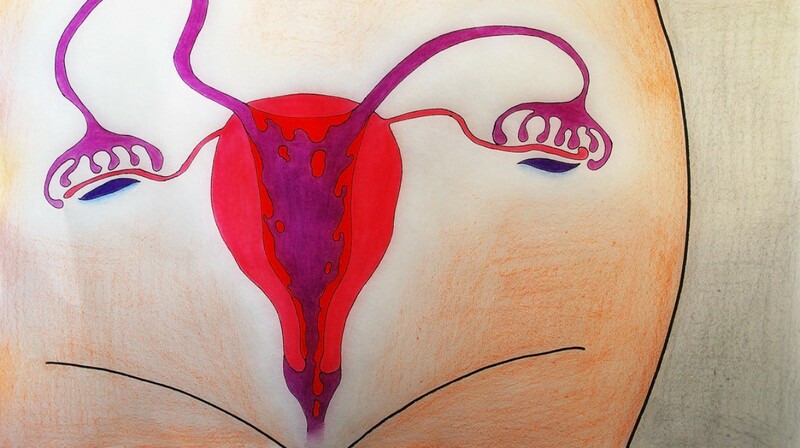 Why is it so hard to just call my period a period? In India, “chums,” as the more classic “Aunt Flo,” and “the crimson wave” are just some of the terms born out of the ingrained need to hide this information. As a college student, my friend Shruthi faced refusal from roommates to accompany her to Madurai (a famous and revered temple-town in South India), when she was on her period. They feared the wrath of the Goddess falling upon them. “The Goddess is a woman and she must have had periods too, so she’ll understand,” said Shruthi, and went any way. She would be considered a rebel by most. I’ve grown used to carefully hiding the excruciating cramps I experience every month. But I now realize that not talking about the severity of menstrual cramps is responsible for the abysmally low levels of research and medical attention it gets worldwide. The segregation doesn’t remain contained within the home. Around 23% of Indian girls between ages 12–18 drop out of school when they begin menstruating, as a consequence of not having access to safe and sanitary protection. It’s one of the very many reasons contributing to the fact that India’s female labor force participation is among the lowest in the world. I often reflect back to that day in the bathroom stall — the day I first got my period. The shame that swept over me came back every single month, right through my years in school and college. At first I was afraid of being bullied for having a stained skirt. In the later years, I was embarrassed by the wad of plastic and cotton between my legs that crackled with every step I took, announcing my period to the world at large. I blame the unhygienic, insufficient toilet facilities in my Indian college for the instances of Urinary Tract Infections that I suffered in silence. But I’m cautiously hopeful that the tide is turning in my country. I was heartened by the Red Alert Campaign in Kerala in December 2014, where thousands of women sent used and unused sanitary napkins to the managing director of a company where 42 women factory employees were strip searched, after a used sanitary napkin was found in a toilet on campus. More recently, the period issue has reached the Supreme Court in India. The SC has been forced to inspect an age-old ban on women between ages 10–55 entering the Sabarimala Temple in Kerala. Just having this brought into question has met tremendous opposition from religious groups and heads across the country. Unfortunately, the Sabarimala Temple isn’t the only one to shun “fertile” women, fearing that the purity of the temple would be compromised if a menstruating woman would enter it. But the fact that it’s up for debate is slow progress, especially in a country where cultural practices passed off as religious ones are considered sacrosanct. Nikita Azad started the #HappyToBleed campaign rising up to challenge the deeply misogynistic and sexist taboos that continue to be upheld in the name of religion. Thousands of women held up placards made of sanitary napkins and posted pictures of themselves on social media platforms. While exciting, I do recognize campaigns like this touch an educated, urbanized, and higher socioeconomic class of women. It’s so far removed from the hundreds of millions of women who face a lack of hygienic access and experience deep segregation unimaginable to most who were part of the social media campaign, including me. I often reflect on my shame and silence, despite growing up in a home that encouraged just the opposite. But the truth is, menstruation is an easy vehicle for gender inequality. It is much easier to dismiss a menstruating woman as impure, condemn her to isolation, and forever silence an entire aspect of her femininity. But that is also also precisely why as a society, we must work extra hard to shatter the silence. To speak up and not cower behind innuendo. That’s just the first step to collectively override the socialization that so often dominates even the most liberal messages we may have heard at home.